More than one million council workers have joined a 24-hour strike over pensions, closing schools, libraries and sports centres, say unions. Services like transport, courts and refuse collection have also been hit. 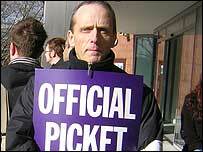 The Local Government Association (LGA) estimated that around 400,000 council workers in England joined the strike. The UK-wide strike is over government plans to scrap a rule allowing some people to retire at 60, without suffering a penalty for retiring early. The government argues the current rule is discriminatory and hopes that an alternative solution can be found. 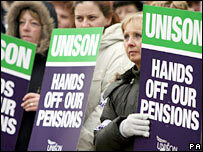 Ministers have called a meeting with employers and unions on Wednesday to try to break the deadlock. Unison, the biggest of the 11 unions involved in Tuesday's action, said there had been "solid" support among members and it could be the biggest stoppage in the UK since the 1926 General Strike. Workers supporting the strike include leisure centre workers, school staff including caretakers, cooks, cleaners and office workers, refuse collectors, housing officers, nursery nurses, youth and community staff and tourism officials. The strike has also affected traffic wardens, housing associations, the Probation Service, the Meat Hygiene Service, street sweeping, home care, occupational therapy and other social services. 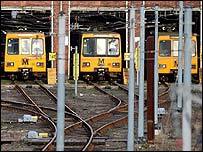 Transport has also been hit as some workers formerly employed by local councils, such as bus and subway drivers, remain members of the pension scheme. All bus and rail services are at a standstill in Northern Ireland, and the Mersey Tunnels in Liverpool, the Metro on Tyneside and Glasgow's subway network have all closed. Do you support the strike? Among the unions taking part are the T&G, Amicus and the GMB. Unison general secretary Dave Prentis said: "Strike action is the only option left to local government workers to demonstrate the burning resentment and anger they feel over the government and employers taking away their pension rights, when those same rights have been given to every other public sector pension scheme. "They are understandably angry at being treated like second-class citizens." T&G general secretary Tony Woodley said: "Three-quarters of those workers are women. "Tony Blair and his colleagues think low-paid women workers are a pushover. Well, he's got that wrong." Unions have warned of further action in the run-up to the local council elections in May. An LGA survey of councils in England suggested that though there had been strong support for the strike in London, Liverpool, Nottingham and the North East, in other areas the numbers were far fewer - with 150 staff out of 14,000 on strike at Buckinghamshire County Council. LGA chairman Sir Sandy Bruce Lockhart said: "Council workers are continuing to do their important jobs well." At the centre of the dispute is the so-called Rule of 85. This allows council employees to retire at 60 without suffering a financial penalty for early retirement, provided their age and years of service add up to 85. The government is planning to scrap the rule for all workers in April, but the unions say it should have been retained for existing workers, and stopped only for new recruits. Employers say that with increasing life expectancy in the UK, the rule means they could face a rise in pension contributions of £5bn to £6bn in the next 20 years. On the BBC's World at One, Local Government Minister Phil Woolas said he hoped an alternative solution could be found. "The question is: Is it possible to replace the benefits that members of the scheme receive from rule 85 in a different way?" "If the unions and the local government leaders can find a way of doing that, our role and John Prescott's role as the regulator of the scheme is to put that into place." But the unions insist local government workers should be treated in the same way as uniformed police, NHS workers, civil servants and teachers - who can all retire on a full pension at 60. Unison says nearly three-quarters of contributors to the local government pension scheme are women, most of whom work part-time and who draw an average of £1,612 (£31 a week) upon retirement. The Office of the Deputy Prime Minister held a three-month consultation on the issue, which finished on 28 February. Talks continued until 14 March when eight trade unions voted for strike action.